Melbourne Cup is one of the most significant events in the world of equestrian sport, which is held every fall in Australia. Fans of this sport from all over the world including celebrities come to watch the jumps. 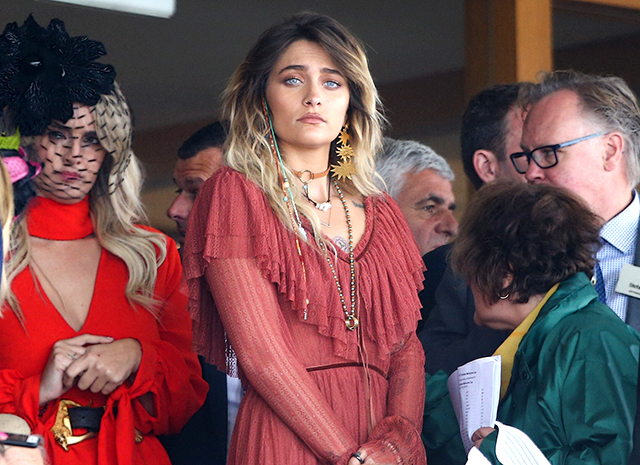 This year, model and actress Paris Jackson was seen at the Flemington Park racetrack. However, what happened on the field turned out to be not so interesting for her, judging by the photographs, she was bored, she decided to entertain the audience and play a little fool. In Australia, 19-year-old Paris arrived for the first time. On the eve of the trip she gave an interview to the magazine Stellar, in which she told why this trip is of particular importance for her. "I've always dreamed to get to this land. Especially after they told me that my parents were married in Sydney". The wedding of Michael Jackson and the nurse Debbie Rowe, who for a long time was his friend, was held November 13, 1996 at the Sheraton in the Park Hotel in Sydney. The couple exchanged vows before 15 friends. At that time, Debbie Rowe was already expecting for the birth of the first child, son Prince, who was born in February 1997. A year later, the couple had a daughter, Paris, and a year later they filed a divorce.